Windows 10 April 2018 Update has been released and scheduled to be delivered via Windows Update beginning on Tuesday, May 8, 2018. However, those who have gone to Settings > Updates & security and clicked the “Check for updates” button have learned that clicking “Check for updates” indicates to Microsoft that you want the April 2018 Update right away. Once you click that button the April 2018 Update (Windows 10 version 1803) will start downloading and will install the next time you restart your computer. It has been reported by many, including some that we trust, that Windows 10 April 2018 Update may not be quite ready for prime time. Rich Woods, from Neowin, is advising his readers to wait a while on the Windows 10 April 2018 Update until Microsoft fixes several bugs that are affecting those who have already installed the new version of Windows 10. We have written about using Metered connection to stop Windows updates, but understand this may affect other things such as OneDrive. If you don’t use OneDrive, Metered connection may work for you. See our tip on Metered connections here. We just tested a program that will stop Windows updates completely. It’s free. All you have to do is download it, install it and run it. Keep in mind, we are not advising you to turn off Windows updates permanently – we are offering this as a temporary solution to stall the Windows 10 April 2018 Update until Microsoft takes care of some of the serious bugs in this version update that have caused some (but certainly not all) early adopters to have major problems with their computers. So, if you want to temporarily stop Windows Update so you won’t automatically get the new Windows 10 version 1803 (April 2018 Update) then Win Update Stop v1.3 will stop it. Just run Win Update Stop and click the “Disable” button. When you’re ready to enable Windows Update, just run Win Update Stop again and click the “Enable” button. It’s simple and easy to use. But again, we remind you, we are not advising you to turn off Windows Update for the long term. 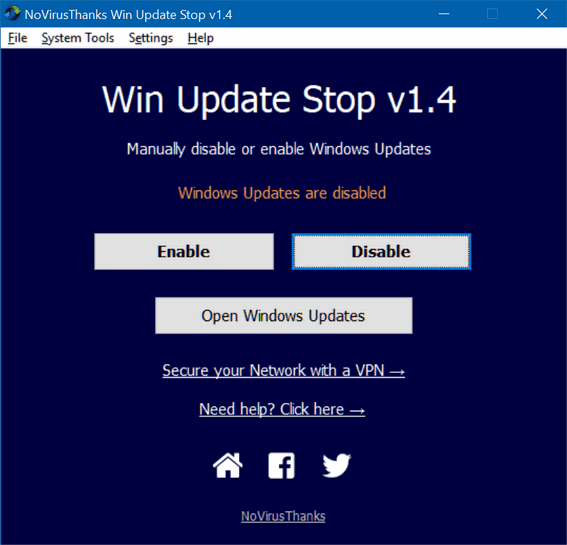 We are recommending Win Update Stop only to those Windows 10 users who want to temporarily block the Windows 10 April 2018 (AKA Spring Creators Update), until Microsoft fixes the problems that are causing major problems for some. This small Windows OS utility allows you to manually disable or enable automatic Windows updates. Sometimes you may want to stop Windows updates so you can choose when to download and install new Windows updates. As you know, Windows updates are very important but they are also known to occasionally create some incompatibilities or problems with the Operating System and the applications installed. Use this utility to block Windows updates and re-enable them when you desire. 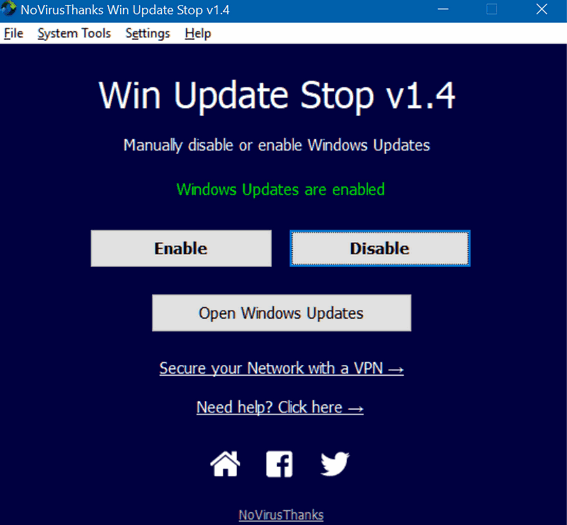 Win Update Stop v1.3 is freeware and it’s free from any malware. You can download it from here. One comes to wonder why in the heck do we need such complicated operating systems in the first place. Life was so much more relaxing when computering was simple. Even in it’s youth we had no idea just how simple computering was. I’m sure I speak for many when I say we don’t need more complications in our lives… not at this stage in our lives. Thanks so much for this info. The Win Update Stop has been installed and I’m sure your faithful readers will watch for the “go ahead” signal. Love CloudEight Info Ave – it’s always filled with helpful tips and information. Installed the new windows release last week and no problems at all. Really like the new features. Too much sky is falling nonsense. I’ve been using Windows 10 Version 1803 since it was released on a non-critical computer. I’ve not seen very many major new features – Timeline seems to be the biggest. As far “sky is falling”, that’s not us. Hundreds of thousands – millions by now – have had problems with the update from nuisance issues to full-blown serious errors. Microsoft is has already acknowledge many of these problems and and are working on solutions. We don’t believe people are just making this stuff up. It very well could be that my May 8, 2018 (the official release via Windows update without user action required) that some patches will be included. We are not the only ones advising users to hold off on the April 2018 update – but this is the first time we’ve ever done so. While you have experience with your computer, we have already gotten a dozen or so emails from our readers reporting moderate to severe problems with the update – and several who have had to roll back to version 1709. We have never in the history of Windows 10 ever advised people to wait to upgrade – but then we’ve never seen a Windows 10 update with so many flaws. We’re not Chicken Littles here. And for the first time ever, we’re not going to update our work computers until Microsoft works out the problems. We have cleaned installed it on couple of our computers but not the computers we rely on for business. The sky is not falling but when we look at the list of errors many people are reporting, we are not going to advise people to become an early adopter. Over the next few weeks, Microsoft will be addressing the bugs in the update. So, we think it’s best for people to wait. However, if they don’t take any action by Tuesday May 8, it will be too late as the update will start rolling out via Windows update without any user action required. Chicken Little? I don’t think so. I’m glad that I’m still using Windows 7. Will think about going to Apple after Windows 7 is no longer supported. Windows 10 seems to be complicated. Apple OS is a much steeper learning curve for you jumping from Windows 7 than Windows 10 is. You can add a Windows 7 start menu and links to control panel, my computer, and other familiar Win 7 icons. Not to mention that with Apple Mac you’re going to spend twice as much for a less powerful computer. Ithis update automatically installed on my 2016 acer laptop and after 24 hours was still at 99% so I switched it off. Couldnt log in so switched off again, managed to log in but but couldn’t use any of the orograms – clicked on the program and it just hung. I have finally had to send it fir repair. If you could get into Settings by using Windows Key + i > Update & security > Recovery > Go beck to a previous build… this would restore your PC back to version 1709. The repair is simply going to be reinstalling Windows from a disk or DVD. You could do this yourself without any cost. Just create installation media, use it to boot your computer and do a repair installation. Doing a repair installation would not only make your computer usable, but also save your programs and files. just tried to post my comment and it said I already had but I haven’t. If you haven’t added a post before, your post has to be approved. I just approved your post. Sorry you had trouble with the update.